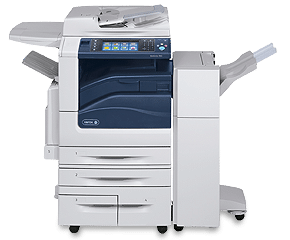 If you are in the copier market, one of the trickier things you can do is settle on which copier you want to purchase. 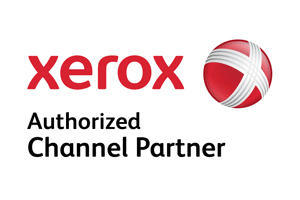 Xerox is the primary brand we sell and we thought it would be good to go over the full product line so you can see where you might fit into their lineup for your business. These copiers will go more or less in order of purchase cost. This desktop copier is designed for low volume printing and minimal use and only in black and white. Under $300. Works, but the scanning can be a bit tricky to set up. Another black and white desktop unit for slightly higher print volumes with slightly lower cost per print numbers. A small color desktop unit that is the go to for those who want something a bit better than you would normally find at your big box store. Watch out for doing too much color on this one. Good unit for low print volume. 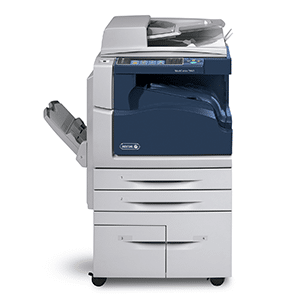 Moving up the product chain a bit, the Xerox WorkCentre® 3335/3345 is good for small teams of professionals who want to make sure they have a solid copier for their team. Add a second paper tray on this model. This is a fast black and white only copier. Now we are getting to more "business quality" copiers. This is the new color copier in the Xerox family replacing the Xerox WorkCentre 6605 color copier. A lot of the 3 to 10 person offices we talk to find this to be the perfect copier for them. As we keep moving up the chain, the copiers get better and more reliable. The Xerox WorkCentre 3615 does a fantastic job on black and white copies. Teams that need speed and a solid copier without breaking the bank tend to choose this copier. No 11 X 17 support though, so be aware of that. Now we are hitting the copiers we tend to sell more often. These start at about $1000 or $20 per month and go up from there. The most expensive is closer to $20,000 or $400 per month. See if any of these copiers are perfect for your business. 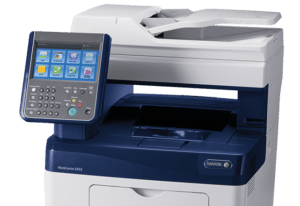 A color copier that is one of our most popular for professionals wanting their team to have something reliable, and that easily handles scan to email, etc. 36 pages per minute in color and black and white. This is a more robust black and white copier that is exceptionally fast and a great bargain! We love this copier for attorneys, accountants, and others who need robust speed, but not a ton of price. Probably our most popular copier at the moment. Laser copier. Simple cost per print. Scan to Dropbox or Google Drive. Great color. Low costs. Higher print volume copier. In the Colorqube family, the most commonly purchased MFP, other than the ColorQube 8700 is the ColorQube 8900. This is a copier that allows for spot color to be billed at a black and white rate. We have had mixed reviews from our clients on the Colorqube family. It seems people tend to love them or hate them. It is always good to see how you plan to use a copier before you buy it. We would love to help you in all things copiers. The wax is a unique technology which is perfect for some applications, and not quite so good on other applications. This is our most popular tabletop copier. 55 pages per minute and less than $100 per month, this copier goes fast and is super reliable. Some of our clients were averaging 35,000 pages a month. That is a bit excessive. Up to 20,000 copies per month would be totally fine. Now we are getting into the bigger copiers (11X17 capable) and ones that tend to be quite a bit more expensive. These are awesome copiers and if you do a lot of printing or have need for 11X17 at times, this section is for you! The first 3 copiers are in the same family. The Xerox WorkCentre 5325, WorkCentre 5330, WorkCentre 5335 - The difference in these copiers are speed. The last 2 digits indicate how fast the product is rated for. A couple of our more common color copiers. This is when you need a device that will work well, and also need 11X17 and color. This is a basic copier, but does a nice job for standard business applications. Here is another family of copiers almost gone and fully moved on to the 78XX series of copiers. Nice LED copiers with low cost per print options and amazing Xerox support! We can help you get the WorkCentre 7525, WorkCentre 7530, WorkCentre 7535, WorkCentre 7545 or the Xerox WorkCentre 7555 copier. These copiers tend to be our favorite copiers. With several hundred units we watch over, this model is by far the one that gives us the least difficulty. I would have everyone get one of these if I had the choice. We have not had any bad feedback on the WorkCentre 7830i, WorkCentre 7835i, WorkCentre 7845i, or the WorkCentre 7855i. If you want the gold standard for a reliable copier, this is the one to choose. For those who would like the same amazing quality as they would get with the 78XX series, but prefer not to have any color, the WorkCentre 5945i/5955i will work amazing. The WorkCentre 5945i is 45 pages a minute and the WorkCentre 5955i is 55 pages per minute. The more impressive part about these copiers is how little help they need to work well and keep your life free of headaches. Notice how many pages they are recommending up to per month on these copiers! If the 5945i or the Xerox 5955i don't work for you because they are too slow, the big brother to that family is the WorkCentre 5865i/5875i/5890i. Like the other Xerox copiers, the last 2 numbers are the speed of the copier. The WorkCentre 5865i is 65 pages a minute, the WorkCentre 5875i is 75 pages a minute and the WorkCentre 5890i is 90 pages per minute. These workhorses will give your team the head start they need to dominate. For the company who wants something big and fast, something that can keep up with rigorous demands, but isn't quite ready to fully invest in a production copier. This is a 70 page per minute color copier with amazing color quality. This is a move up the ladder from the WorkCentre 78XX family. The last copier we would like to talk about is the Xerox® Color C60/C70 copier. This is a very high end copier for those places that want to do color, and have the quality print shop level quality. We know the high volume color copier buyers will love this copier. Add account codes, make color available for some or all. Scan to Google Drive or Dropbox easily. This copier is awesome for those who want the very best.